Magic Mountain is an anomaly in Southern Vermont. Steep and challenging, yet laid back and inviting, it exemplifies what old school minimalist skiing is all about in stark contrast to many other area resorts. Totally dedicated to the skiing, no shops or stores can be found in Magic’s base area and only two fixed grip lifts run — redline and blackline — but both will bring you straight to the top. Whether you’re a beginner looking to get better, or an advanced skier looking for an actual thrill and not “wait in line most of the day to ski scraped off groomers for $100” McSkiing, here’s your chance to find your home at a fraction of the cost. If you’re a tree, cliff or powder skier you’re in for a real treat, as Magic prides itself on being the home of the most challenging and cleanest trees in Southern Vermont as well as the biggest cliffs and steepest trails. Both fixed grip chair towers are below the tree tops and run steady, which means it’s an ideal storm day destination with very few wind holds. On-map tree runs have doubled in the last two years (which have also all been expanded as well) and countless hidden runs exist throughout the mountain, just waiting for you to discover them either by your own accord or perhaps with a friendly local bribed with one of the many microbrews on tap. Its open tree skiing policy is designed to allow for exploration and adventure and those who choose to do so will not be disappointed. 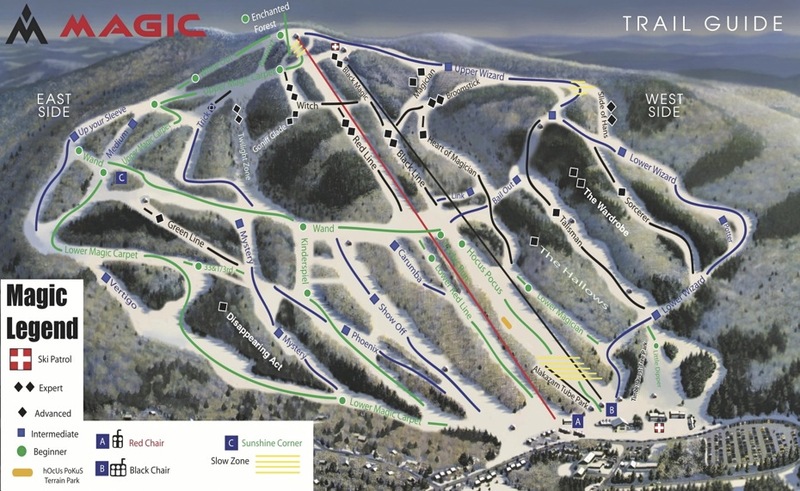 It’s not all cliffs and steep trees though, with many recent upgrades in snowmaking capabilities and a significant upgrade in grooming equipment and operators, Magic now offers the same quality of groomed surfaces as its counterparts across the valley — but with about 5k fewer skiers a day to scrape it off ensuring excellent cruising from bell-to-bell. From the very first time you ski here, it will be glaringly obvious that “It’s all about the skiing, the challenge and the mountain.” Magic is run by skiers on every level and great effort has been put forth to retain the highest quality skiing possible at an affordable price — weekend tickets are still only $59 — quite the deal in today’s economy. With many hidden gems, fewer traffic and some of the best snowfall around you can find fresh snow days after a storm and there are many, many cliffs to discover, both hidden and in plain sight, when you want a little air under your skis. If you feel the normal resort experience detracts too much from being out on the mountain and the skiing itself, Magic is for you. If you feel that skiing has become too expensive, too restrictive and too crowded, Magic is for you. If you want to be part of a community dedicated to preserving one of Skiing’s original purist destinations, Magic is for you. In short; if you’re here to ski and just want to have a good time, Magic is for you. With inexpensive lodging nearby and a significantly shorter drive than comparable skiing destinations to the north, it’s the smart way to get your adrenaline or family outing fix without paying double for frills you don’t want or need. If you’ve been to Magic in the past, come and see what’s new. If you have never been, there has never been a better time to come and see what all the fuss is about!